Android 7.0 Nougat is at the doorstep of all flagship devices, while Marshmallow continues it crusade across the ecosphere. 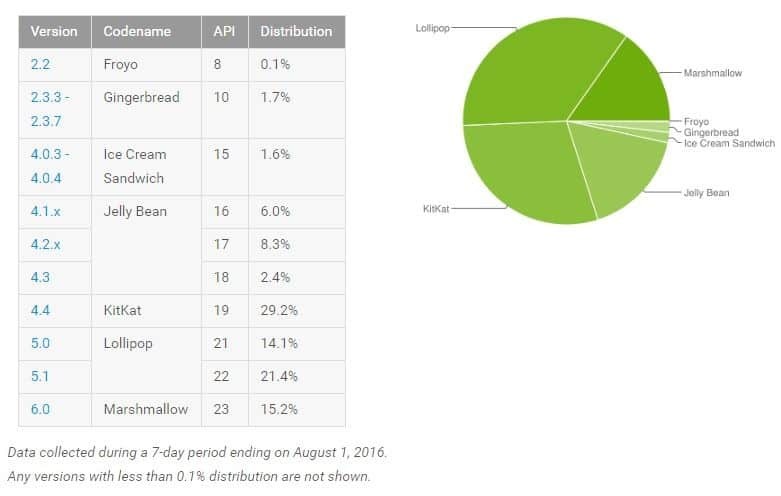 Despite the considerably slow start, Android 6.0 Marshmallow market share is moving up steadily at 15.2% as of August 2. Meanwhile, Android 5.0 Lollipop continues to dominate the Android market share with 35.5%, which is .4% up from July. Android 4.4 KitKat has dropped from 30.1% in July to 29.2% in August, while Jelly Bean is down to 16.7% from 17.8%. Ice Cream Sandwich, Gingerbread and Froyo have also dropped a few points. The way devices receive the latest Android OS updates is quickly shifting in a different direction. Back in the day, all flagship devices would be updated to the latest version as soon as they were released. However, even after months of Nougat being announced at Google I/O, even Nexus 6P is yet to receive the update. While the Marshmallow market share quietly increases, Android Nougat will soon make up for a tiny part of the Android ecosphere. Some rumors suggest that the Android 7.0 update will be out for Google Nexus devices by the end of the month. If this rumor is to be considered true, Nougat for the latest flagship devices should swiftly follow. What part of the ever-growing market share does your Android device belong to? Let us know your thoughts in the comments section below. How to Reset AOL Mail Password?